Cool Candles supplies a wide range of quality pillar candles for Australian wholesale & retail customers. 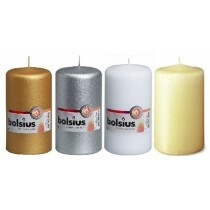 Our range focuses on premium Bolsius brand products, as well as economy pillar candles which live up to our own high standards. For even better value, Australian business owners can access wholesale prices by applying for wholesale status. 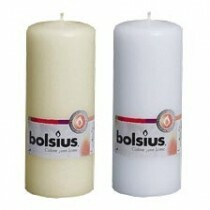 Bolsius pillar candles are the stars of this product range. These European pillar candles are manufactured to robust quality standards, using the finest raw materials to create a premium product. Their superior quality makes them a top choice for beautiful flames and consistently long burn times. 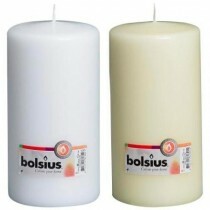 Under normal conditions, Bolsius pillar candles won't drip, tunnel or smoke, so each candle lasts as long as possible. You don't get mess or soot - just hours of beautiful candlelight. 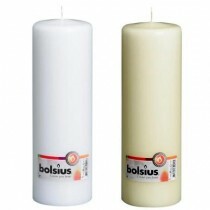 Alongside our premium Bolsius range, Cool Candles also offers a pillar candle value range. These economy pillar candles are more competitively priced, while still offering a high standard of quality and stylish design. 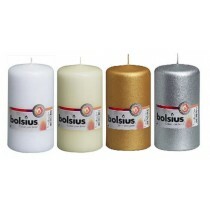 Our entire pillar candle range is also available at wholesale prices for Australian business customers. To access wholesale prices, please use this form to apply for wholesale customer status. 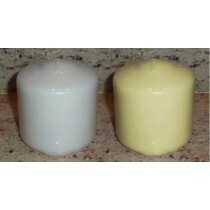 Pillar candles are large, stable, and long-burning classic candles. Because they are larger than tea lights or votives, they offer longer burn times than small candles can provide. 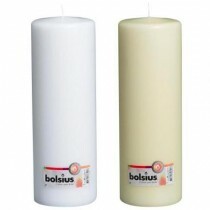 Even our smaller pillar candles offer at least 7 hours of light, while our largest provide an incredible 200 hours. There's no question that if you want your candles to burn all night long, pillar candles are the way to go. 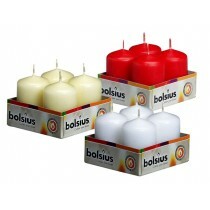 The size and stability of pillar candles also makes them very versatile. They look great as free-standing lighting, set in a candelabra, inside a lamp or in a hurricane glass. Because they offer a range of heights and diameters, they are excellent for creating eye-catching arrangements and centrepieces. 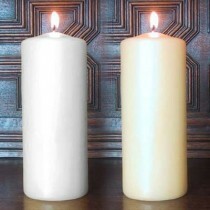 It's no surprise that pillar candles are an enduring favourite for weddings, churches, and a variety of formal events. Classic candles with a timeless appeal, pillar candles are perfect for building an elegant atmosphere in any setting. While pillar candles offer many hours of light, improper use can significantly shorten their lifespan. Below are some useful tips for keeping your pillar candles burning clean and efficient. As your candle burns, the wax will melt to expose more of the wick. For best results, always trim the wick to about 1cm before lighting your candle. Why? Because when too much wick is exposed, the flame will be larger, leading to a shorter burn time. A flame which grows tall enough will also produce smoke and soot - very unpleasant to breathe or clean! A long wick may also lean to one side, making the wax melt unevenly. This can cause tunnelling or let the melted wax escape, leading to messy drips and a much shorter lifespan. You should always burn your pillar candle for a minimum of 2-4 hours once lit. The ideal time depends on the size of the candle - if the melted wax reaches almost to the edge of the candle, you'll know it has been long enough. If you repeatedly burn your candle for a short time, the level of wax will lower only in the centre of the candle, creating a tunnel around the wick. This wastes a lot of wax, meaning a shorter burn time. It will also lead to the wick being drowned, as melted wax from the tunnel sides fills the centre with liquid. If you only want candlelight for a short time, consider lighting a smaller candle (like a tea light or votive) instead. Under normal conditions, quality pillar candles like ours won't produce tunnelling. However, some conditions (such as repeated short burns) may cause tunnelling even with top quality candles. If you see tunnelling starting to form, it's best to trim down the wax around the outer edge. If you ensure that the sides rise no more than 1cm above the base of the wick, you should be able to keep the wick from being drowned. Small pieces of debris, like a fragment of matchstick or broken piece of wick, can easily wind up in your candle. 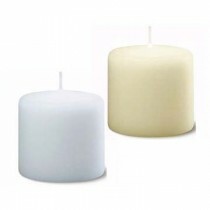 These can prevent your candle from burning cleanly, and even act as a second wick if they are flammable. This will reduce the life of your candle significantly, so always clear any foreign matter away before you light. When burning your pillar candle, keep it in an upright position. Burning at an angle will cause the wax to spill, greatly reducing burn time. Environmental conditions can also affect the life of your candle. Avoid lighting candles in temperatures above 30°C, as they are likely to melt very fast and lose their shape. Also, try to avoid windy conditions. Even a mild breeze can cause the flame to "lean" in a particular direction, making the wax melt unevenly and create tunnelling or spillage. With proper usage, you (or your guests) will enjoy many hours of beautiful candlelight from your quality pillar candles.